Dis­ney­land Resort will open the high­ly antic­i­pat­ed Pixar Pier at Dis­ney Cal­i­for­nia Adven­ture Park on June 23, 2018, pow­er­ing up sum­mer with more of the play­ful Pixar sto­ries and char­ac­ters that guests have come to know and love. 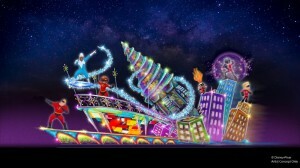 Also debut­ing in June, a new float adds super­hero fun to the elec­tri­fy­ing “Paint the Night” parade, fea­tur­ing char­ac­ters from Disney•Pixar’s “The Incred­i­bles.” The news was announced today by Walt Dis­ney Parks and Resorts Chair­man Bob Chapek dur­ing his pre­sen­ta­tion at D23 Expo Japan at Tokyo Dis­ney Resort. At Pixar Pier, guests will explore four new imag­i­na­tive neigh­bor­hoods, new­ly themed attrac­tions, enter­tain­ment, encoun­ters with Pixar pals, plus themed food and mer­chan­dise, all inspired by beloved Pixar sto­ries. The fan-favorite “Paint the Night” parade returns April 13 for Pixar Fest, this time at Dis­ney Cal­i­for­nia Adven­ture. And in June, the pop­u­lar night­time spec­tac­u­lar adds even more Pixar fun with the addi­tion of a new, high-ener­gy float inspired by “The Incred­i­bles.” Mr. Incred­i­ble, Elasti­girl and Fro­zone will show­case their super­hero awe­some­ness as they take on their newest threat, the Under­min­er. Vio­let, Dash and Jack-Jack also show­case their unique pow­ers in sur­pris­ing new ways, as shown through dynam­ic and inno­v­a­tive visu­al tech­nol­o­gy. Like the oth­er ele­ments in this spec­tac­u­lar parade, this new float will come to life through a series of daz­zling LED lights, new music ele­ments and high-tech, pop-art effects inspired by the mid-cen­tu­ry-mod­ern style of the films. The thrilling new Incredi­coast­er will anchor Pixar Pier in the new land’s first neigh­bor­hood, which is inspired by “The Incred­i­bles.” New char­ac­ter moments, scenes, spe­cial effects and an excit­ing musi­cal score will con­nect the attraction’s sto­ry to “Incred­i­bles 2,” which opens in the­aters June 15, 2018. A sec­ond neigh­bor­hood at Pixar Pier will be inspired by “Toy Sto­ry” around the pop­u­lar Toy Sto­ry Mania! attrac­tion. The third new neigh­bor­hood will be inspired by “Inside Out” and will fea­ture an “Inside Out” attrac­tion, sched­uled to open at a lat­er date. The fourth new neigh­bor­hood will cel­e­brate a col­lec­tion of Pixar sto­ries. Mickey’s Fun Wheel will trans­form into a new­ly-themed Pixar attrac­tion, allow­ing guests to enjoy the beau­ti­ful sights of Pixar Pier from 24 new gon­do­las that will fea­ture beloved Pixar pals. The mid­way games will also be inspired by Pixar char­ac­ters, includ­ing favorites from “A Bug’s Life,” “La Luna” and “WALL•E”. 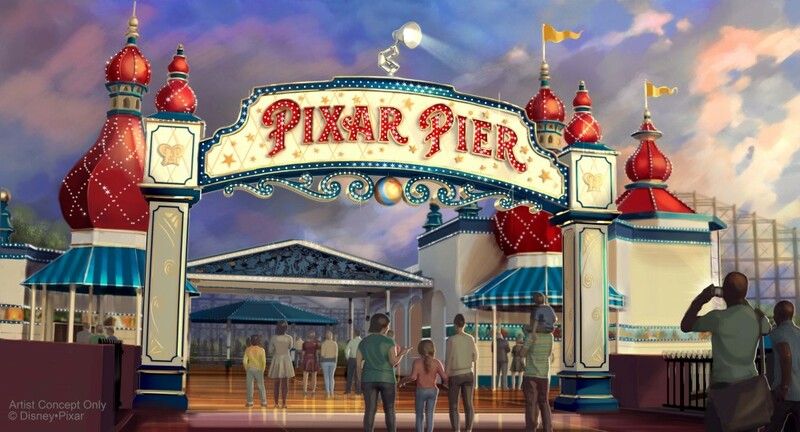 Addi­tion­al­ly, what was for­mer­ly Ariel’s Grot­to restau­rant and the Cove Bar will be trans­formed into a Pixar-themed lounge, offer­ing sparkling views of Par­adise Bay and the new Pixar Pier. Pixar Fest will allow guests to cel­e­brate friend­ship and beyond dur­ing this lim­it­ed-time event, bring­ing Pixar sto­ries and char­ac­ters to life like nev­er before. At Dis­ney­land, a new fire­works show, “Togeth­er For­ev­er – A Pixar Night­time Spec­tac­u­lar,” will debut with daz­zling pyrotech­nics, mem­o­rable music and a heart­warm­ing sto­ry. A new film fes­ti­val, Pixar Shorts, will also take place through­out much of Pixar Fest at Dis­ney Cal­i­for­nia Adven­ture. Pixar Shorts will fea­ture rotat­ing favorites includ­ing “For the Birds” and “LAVA” at the Sun­set Show­case The­ater in Hol­ly­wood Land. And in the Par­adise Gar­dens area at Dis­ney Cal­i­for­nia Adven­ture, many new Pixar expe­ri­ences will be avail­able for guests to enjoy includ­ing per­for­mances by a new Pixar-themed musi­cal troupe, Pixar char­ac­ter encoun­ters, and spe­cial crafts and activ­i­ties for younger guests. Pixar Fest will also fea­ture addi­tion­al ele­ments through­out the resort includ­ing new décor, atmos­phere enter­tain­ment, themed food and bev­er­age and lim­it­ed-edi­tion event mer­chan­dise. All of these excit­ing new addi­tions for the lim­it­ed-time Pixar Fest cel­e­bra­tion and the open­ing of the new land of Pixar Pier will add to the exist­ing Pixar attrac­tions and enter­tain­ment cur­rent­ly avail­able through­out the Resort, from Buzz Lightyear Astro Blasters at Dis­ney­land to Cars Land at Dis­ney Cal­i­for­nia Adven­ture. The Dis­ney­land Resort fea­tures two spec­tac­u­lar theme parks – Dis­ney­land (the orig­i­nal Dis­ney theme park) and Dis­ney Cal­i­for­nia Adven­ture Park – plus three hotels and the Down­town Dis­ney Dis­trict, com­pris­ing unique din­ing, enter­tain­ment and shop­ping expe­ri­ences. The Resort’s hotels are the lux­u­ri­ous, 948-room Disney’s Grand Cal­i­forn­ian Hotel & Spa, which also fea­tures 50 two-bed­room equiv­a­lent Dis­ney Vaca­tion Club units; the mag­i­cal, 973-room Dis­ney­land Hotel – both AAA Four Dia­mond prop­er­ties – and the 481-room Disney’s Par­adise Pier Hotel with its “day-at-the-beach” theme. For infor­ma­tion on attrac­tions and vaca­tions at the Dis­ney­land Resort, vis­it Disneyland.com, call (866) 43-DISNEY or con­tact local trav­el agents. Locat­ed in Ana­heim, Calif., the Dis­ney­land Resort opened July 17, 1955. Open dai­ly, year-round. Pixar Ani­ma­tion Stu­dios, a whol­ly owned sub­sidiary of The Walt Dis­ney Com­pa­ny, is an Acad­e­my Award®-winning film stu­dio with world-renowned tech­ni­cal, cre­ative and pro­duc­tion capa­bil­i­ties in the art of com­put­er ani­ma­tion. The North­ern Cal­i­for­nia stu­dio has cre­at­ed some of the most suc­cess­ful and beloved ani­mat­ed films of all time, includ­ing “Toy Sto­ry,” “Mon­sters, Inc.,” “Cars,” “The Incred­i­bles,” “Rata­touille,” “WALL•E,” “Up,” “Toy Sto­ry 3,” “Brave,” “Inside Out,” and “Coco.” Its movies have won 32 Acad­e­my Awards® and have grossed more than $11 bil­lion at the world­wide box office to date. “Incred­i­bles 2,” Pixar’s 20th fea­ture, opens in the­aters on June 15, 2018. Kens­ing­ton Palace issued a state­ment about the harass­ment cur­rent­ly being expe­ri­enced by Meghan Markle and her fam­i­ly.